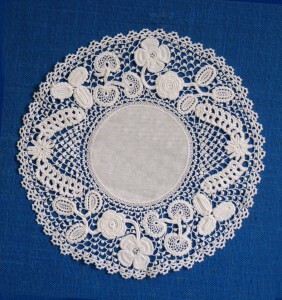 The earliest examples of Irish Crochet Lace are believed to date from about 1830 and were made by the students of the Ursuline Convent in Cork. 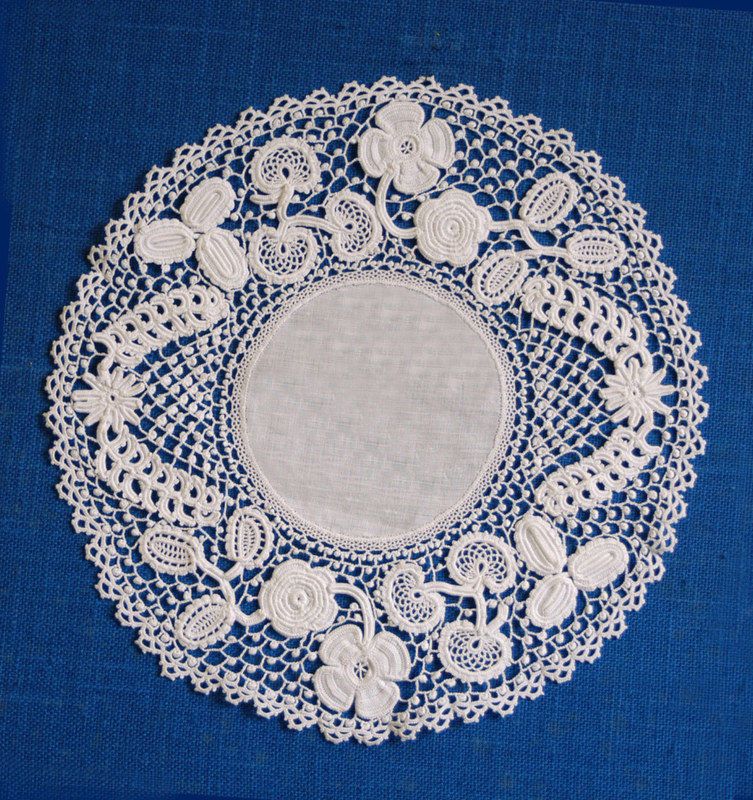 Mrs. Martha Roberts, wife of the local rector, having unpicked a sample of Venetian Lace proceeded to replicate it in Irish Crochet Lace. In an effort to alleviate the hardships of the Great Famine she started teaching this Irish Crochet Lace at Kilcullen, Co. Kildare in 1846. Soon, her most industrious pupils were producing lace of a very high standard. Those that Mrs. Roberts trained was required to teach another three ,and so on, until hundreds had learned to crochet. At one time there were as many as 700 people, in that area alone, earning a living from crochet. It is estimated that there were as many as 20,000 people earning a living from lace making in Ireland in 1852. It is interesting to note that one of Mrs. Roberts best workers went to Mrs. Cassandra Hand in Clones Co. Monaghan and from this began the long tradition of lace making in Clones and the surrounding areas. Another of her teachers went to New Ross and was involved with Sr. Columba, of the Convent of Mercy, in the development of the lace school. Others of her teachers went to places around Ireland such as Donegal, Sligo and elsewhere. The development of lace making owes much to the efforts of the Sisters of the various religious orders such as Nano Nagle, Sr. Columba and many others. Also, the wives of many of the church Rectors were very active in encouraging the teaching of lace-making. The promotion and commercial development was greatly assisted by the patronage of the likes of Lady Aberdeen, Lady Erne, Countess Markiewicz and other prominent ladies of that era. Irish Crochet Lace was much in demand by the fashion houses of Paris and London and was used extensively on elaborate gowns and evening wear in the latter part of the 19th century. The introduction of cheaper machine-laces and a decline in quality standards led to a decline in sales. Commercial production having ceased by about 1912. Happily the making of Irish Crochet Lace has continued on an individual basis and is actively promoted by the Guild of Irish Lace Makers.